Elegant Long Red Cotton Kurtha / Tunic for women. Looking for a way to diversify your attire for the day? 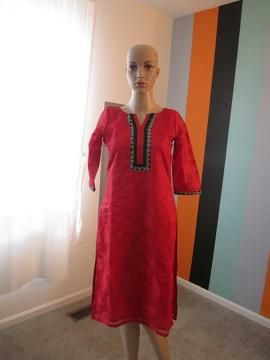 Then go ahead and wearing this red coloured kurta by Elegant Attire. This kurta is made from Chanderi Cotton, which ensures complete comfort and breathability to the wearer. Pair it with matching leggings and sandals to get complimented for your classy choice. This item in Indian Kurtis & Tunics category was first added to our catalog on 11-02-2016. Buy Embroidered Red Cotton Kurtha / Tunic (S-L), sold & shipped by Elegant Attire where you can shop online for Bespoke Designer Indian Fashion Clothing for Girls and Women. This Kurtis & Tunics collection has been tagged as kurtha,kurthi,red,black,cotton, women kurta, long ladies top.